Hardwood over concrete is acceptable in some applications, but only if the sub floor meets the standards set by the NWFA. Therefor it is highly recommended that this application be researched thoroughly. Solid hardwood flooring should only be installed in an on or above grade condition. If the soil surrounding the structure is 3″ or more above floor level, solid wood flooring should not be installed. Always put down an approved vapor retardant such as #15 asphalt paper between the sub floors and flooring to be installed. 3/4″ solid wood flooring should be either nailed down or stapled using 1-1/2″ minimum length nails or staples. Minimum two (2) fasteners per piece, 3″ from ends and every 10″ continuous throughout the length of each piece. Insure that the nail gun or stapler being used is fitted with the proper foot or shoe that does not damage the edges of the flooring. End joints should be staggered at least 6″ from those of the previous row. Nail all flooring at right angles (perpendicular) to floor joists. Allow room for expansion (suggested 3/4″) between wood flooring and walls or any other obstructions. 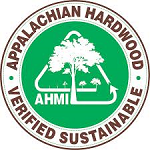 LIMITED WARRANTY Turman Hardwood Flooring hereby warrants, to the original buyer only, that the products are free of manufacturing defects within the five (5%) percent limit and will not wear through the top finish for a period of twenty (20) years after the date of shipment by Turman Hardwood Flooring or any respective distributors thereof. Character Grade has a five (5) year warranty. This limited warranty does not apply to Utility Grade or any other downgraded or discounted items. All other warranties are hereby disclaimed, expressed or implied. None of the manufacturer’s agents has the authority to add to or change these warranties in any way.